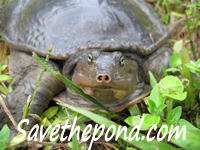 Information on turtle ponds and links can be found on my turtle pond page and information on species of turtle can be found on my turtle species page. Information on caring for hatchling and baby turtles can be found on my hatchling turtle page. This same information often applies to adult turtles as well and may be of some help to those with larger turtles as well. Disclaimer: I am NOT a turtle expert. I got my first turtle in April of 2002. Please do not rely solely on any information contained on these pages. See my main turtle page for more information. A simple setup for a small to medium sized aquatic turtle or two would include the following components: A glass aquarium of minimum 20 gallons with a 40 gallon breeder or larger tank being ideal; a screen lid; an incandescent lamp for heat and light on top of the screen and over the land area; a full spectrum fluorescent light to provide UVB and other natural components of light (sunlight would be an alternate choice if the tank were placed near a window but would not overheat); water filled to cover the turtle so that the turtle can sit in it with its head sticking out while resting (a deeper area is okay but there should be an area where the turtle can rest in shallow water); a land area created with slate, rocks, etc. that does not have any sharp edges; an easy way for the turtle to get from the water to the land; a heater in the water if it is below the turtle's preferred range; a filter for the water (a Duetto filter works well); a food dish; and other odds and ends. Total costs in the USA will run about $100 to $300 for this setup. The water should be kept clean by changing it as often as needed (this is the biggest pain with keeping aquatic reptiles unless you can have a drain built in; I hate changing my lizard's 10 gallon "pond"). For more detailed information, visit some of the links listed at the bottom of my main turtle page. Also, see my turtle tank page for more details. For a detailed setup for baby and small turtles, see my hatchling turtle page. If the water is not properly filtered and/or changed, a build up in ammonia, nitrite, and other chemicals can result in sick turtles. To prevent fungus, you can add about 1/4 a cup of aquarium salt per 5 gallons of water. I usually do about a tablespoon per gallon or two. Turtles can absorb chlorine from the water so, if you have city water, adding dechlorinator (sold for aquarium fish) is a good idea. Water with turtles in it fouls quickly from partially or uneaten food and the turtle's waste. For that reason, it should be filtered and/or changed often. If there are no other animals with the turtles (which is preferred), then doing 100% water changes is not a problem. One way to keep the water more clean is to feed the turtle in another container of warm water. This not only keeps the uneaten food out of the main tank but most turtles will defecate in warmer water thereby reducing that load (pun intended). The following predators may attempt to eat your aquatic turtles: raccoons, opossums, muskrats, alligators (if you live in the South and have them), bullfrogs (they cannot eat the bigger turtles), large fish, herons, osprey, skunks, snakes, hawks, owls, eagles, snapping turtles, and other large predators. Large turtles are usually safe but little ones are much more susceptible. Thus, any baby turtles should have their enclosures secure on all sides and top or bring them inside until they are larger. Lots of vegetation reduces the chances of predators getting your turtles. Water turtles from areas that normally have a winter with low temperatures (under 50 degrees F) require a period of hibernation. During this time, they sleep and rest and do not eat. In the fall, place a container of soil (a cat litter pan or a Lerio pot would be a good choice) in the deepest part of the pond. The turtles should bury in it. They can bury in planted pots if there is enough room among the roots. After you see the turtles up and about in the spring, you can remove the dirt. That would be a good time to clean and vacuum out the pond as long as the turtles seem alert. Also, see my section on turtle ponds in winter. For indoor turtles, many enthusiasts hibernate their temperate climate turtles artificially over winter. This can be done in a cold garage or basement or in a refrigerator that is dedicated to live animals and set at the proper temperature. As I have never done this, please consult an expert before trying this. From what I have read, they are usually put in plastic shoe boxes with no lids (or better yet, lids with good amounts of holes for ventilation) in about an inch of water and checked on often. The temperature depends on species but most do fine at about 40 degrees F. Do not feed during this time but change the water every week or so. Go to a vet if it is serious. See the sections on turtle books and turtle sites for more information. I have moved and expanded this section to my turtle health page so please go there.